Firefox causes me no problems, nor does IE. What makes me suspect it is KAV is that everything was working fine, until I rebooted after installing KAV 2015. Also, removing https and replacing it with http in the URL will allow the site to load. I even uninstalled kav in an attempt to troubleshoot, and sure enough removing it got rid of the problem. When I re-installed this problem returned. Is it possible that KAV is causing this? Is there a way I can find out for sure? Any suggestions on how to fix it would also be appreciated. Try to diagnose which protection component causes the issue by turning them off one-by-one. Most likely it will be Firewall or Application control, in this case, check if adding the browser as an exclusion helps. I use Pale Moon as my default browser and have not see the problem you describe either with Windows 7 or Windows 8.1. It would be worth making a new clean PM profile and checking again. You have asked Pale Moon to connect securely to www.google.com, but we can't confirm that your connection is secure. 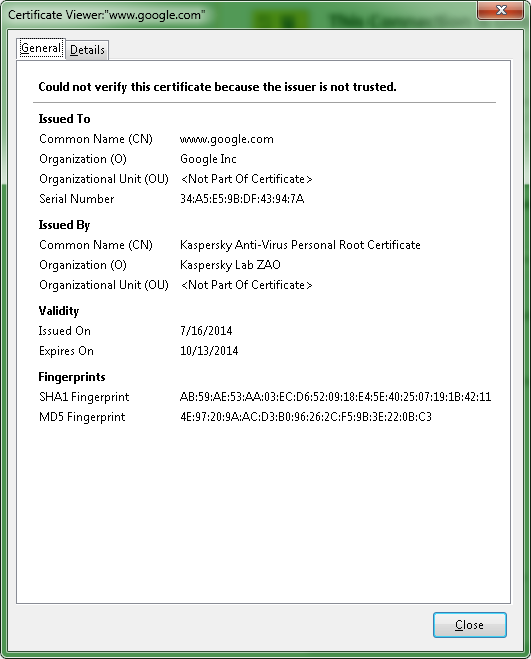 Maybe it is some sort of certificate issue? If I confirm the security exception google works and all is well...Should I just do this? I feel like this should be something transparent to the user though, that I should not have to do? Thank you for chiming in, seems to indicate that this may indeed be something which is caused by KAV/KIS-2015 and not something specifically wrong with my machine. I had this problem, it turns out that after the KIS 2015 post install reboot, my system clock was reset the motherboard creation year (2009), but the same date. Once I set my clock to the right date and time, the SSL certs stopped freaking out by my websurfing from the past. I don't know if KIS 2015 is the culprit or not, but I figured I'd share my solution to the problem. 2) Enable Tracing: In the bottom left corner of the main Kaspersky Window click “Support” ->“Support Tools", "Enable Traces" on Recommended trace level. Please note that we require both GUI and SRV traces. Please upload traces to our FTP: http://support.kaspersky.com/faq/myaccount#section2 or to any freeware file-hosting service and submit a download link. If possible, please pack traces in an archive with maximum compression.